When you make changes to a database, you must save them so that the changes are not lost. However, the file 'Database1', and its associated Piece List, Vehicle List, Weapon List, and Sound List are protected, so, if you make changes, you must save them with a different name. 1. 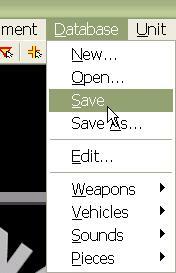 Select the 'Save' function from the 'Database' menu in the ATF Power Toolkit. If you have opened the original Armored Task Force database, you will be prompted to provide names for the various pieces of your new database. We recommend using the same file name, with different extensions, for your database components, so you can easily discern what pieces go to your database. It is also not a good idea to give your database the same name as one of your custom scenarios, as it will be hard to distinguish your database files (which can be used in multiple scenarios) from the scenario files which apply only to your scenario. 2. To use your database in a scenario, after creating a new scenario using ATF Scenario Builder, select 'Import Database' from the 'File' menu. When, prompted, select your database and you will be all set! Your database will be loaded into the scenario.